Meridian is a self-service industry pioneer, leading in innovation and precision since being founded in 1999. A fully integrated manufacturer, we design, engineer, fabricate, assemble, deploy and support self-service solutions from our 13-acre headquarters in North Carolina. Meridian is an ISO 9001:2015 certified company and UL self-certify facility. 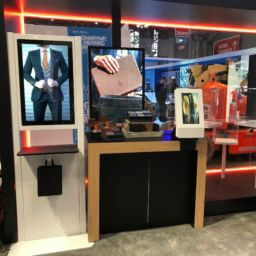 With all processes, from software development, to powder coating, to quality control completed in-house, we proudly offer American-made interactive kiosks to a global marketplace. We believe form and function belong together. It’s why our kiosks are built from beginning to end by our own team of industry experts, ensuring the combination of engaging design and reliability. Because we own the entire process, we can guide our clients from start to finish, creating robust solutions that help clients reach their specific goals. We understand that people want to engage with a secure, reliable, user-friendly interface. That’s why our team designed and developed our own compilation of award-winning software tools. We created Mzero Software based on the idea that businesses, large or small, should be able to manage and maintain successful self-service solutions across the globe. We specialize in helping companies optimize brand impact and extend brand reach with self-service solutions. 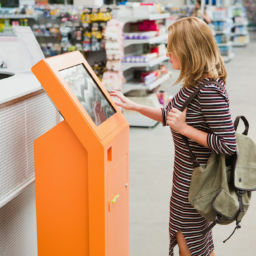 Whether it’s providing a wayfinding service, payment solution, advertising platform or a completely custom capability, we’re focused on encouraging audiences to engage with our clients through interactive self-service kiosks and software. We strive to not only provide digital solutions of the highest quality, but also equip our customers with the most up-to-date information about the industry. Our compendium of content and insights highlights how digital kiosks and signage are bringing positive change, identifies best practices for successful deployment, and provides an inside look into the industry. At Meridian, we’re committed to developing innovative self-service solutions. of self-service solutions for our clients globally. When you set out to disrupt a market that has been doing it the same way for decades, you need a total solution. Meridian delivered what others couldn’t. We have enjoyed several pleasant years working with Meridian. Their flexibility, design acumen, technical expertise, and manufacturing capabilities exceed what we have seen from other vendors. 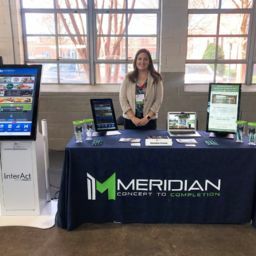 Thanks to Meridian Kiosks, we now have a 24-hour “ambassador” for Martin County, NC. We tried installing one of the kiosks and it has convinced us that we will be adding additional units in the future. 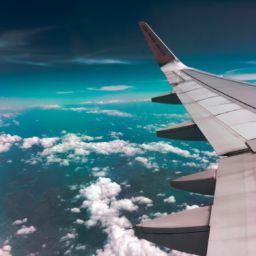 We’ve collaborated to leverage and build a scalable, consistent, and exceptional on-site service program that successfully supports our global mobile deployment for our OEM clients. The Mzero suite gave us a peace of mind when we deployed our kiosks. With the monitoring features we opted for, we felt that it was fully secure and protected. I highly recommend this state-of-the-art self-service software. Upon launching Mzero Software on our kiosks, we were amazed how easy it was to use! We loved being able to login to MzeroNet from anywhere and view the status of our unit, change our attract screen and see how many people are using the units, and for how long.